This entry was posted in news on January 1, 2015 by James Day. Today marks the 10-year anniversary of the Library of Motoring. 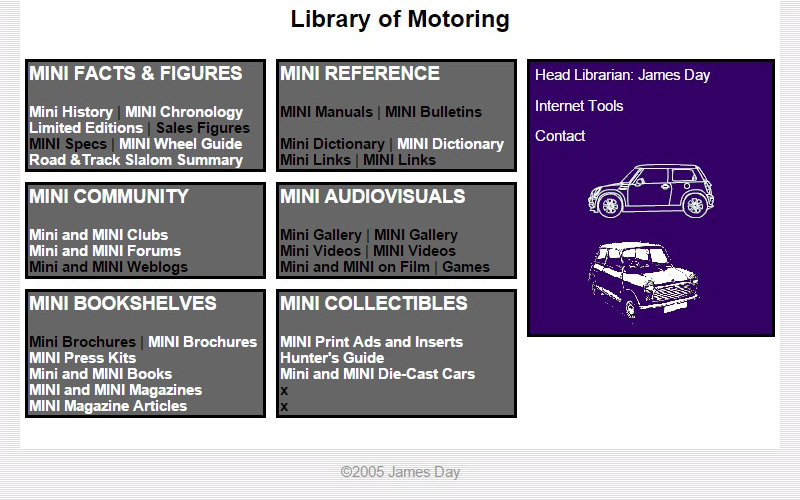 LOM launched on January 1, 2005 initially as a website to catalog MINI ads, brochures, books, and magazines for fellow MINI collectors. There were many more of us back then. The first version (see image) was a basic website without a blog. Version 2.0 was an expanded website with the now familiar orange color scheme. Library of Motoring version 3.0 was introduced on December 1, 2009 with the full launch on January 1, 2010, its fifth anniversary. The site was now a modern blog built on WordPress and the Library of Motoring logo was introduced for the first time. That was a very busy year with the Collectible of the Day series where we featured a different MINI collectible each day for 365 days. It was a lot of work selecting, photographing and scanning, and writing details about them! Updated in January 2014, the current LOM website is version 4.0 with a new, modern theme which also works on mobile devices. This proved useful when we created a mobile website for MINI TAKES THE STATES 2014 which was very popular. Ten years later and the Library is still going. We’ve seen the MINI model family grow to unexpected size. MINI is moving into its third generation. John Cooper works was brought in-house and made into a full sub-brand. MINI clubs expanded, MINI forums sprung up to connect enthusiasts, and MINI moved full-throttle into the social media age. However, we think there’s still a place for MINI enthusiast websites and blogs to chronicle the changing times. We’ve never done much promoting of the Library of Motoring. But if you like it and think it would be useful for others, please share the site on your favorite social media websites. You can also follow the Library of Motoring on Facebook, Google+, and Twitter.